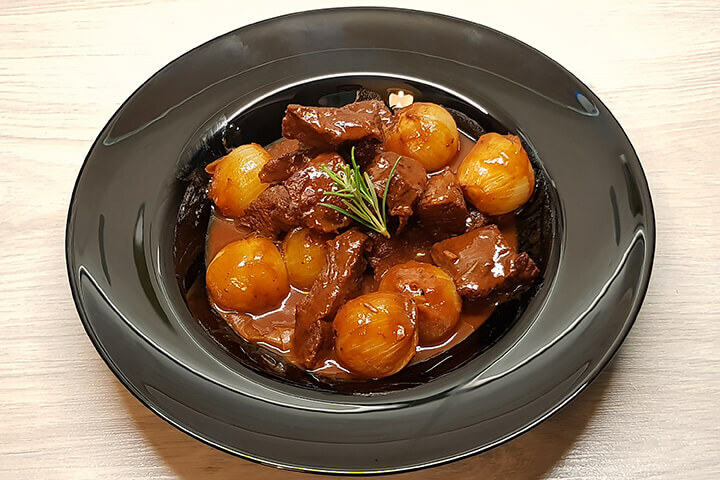 Stifado is a traditional Greek and Cypriot stew that is usually made with beef or rabbit but can be made with octopus, tripe or even chestnuts. The name stifado is thought to have originated from the Italian word stufa, which translates to the word oven. Historians believe the dish to have been brought to Greece by Venetians. The Venetians arrived after Constantinople’s fall and before the Ottoman invasion. The name most likely has to do with the fact that prior to modern appliances like slow-cookers arriving in Greece, slow-cooked dishes were taken to the local bakery to be cooked in the oven. Stifado is not strictly a Cypriot dish; it can be found all throughout Greece, with different regions having their own distinctive versions. One of the most unusual characteristics of this slow-cooked dish is the fact that it uses whole onions. Usually, the onions are pearl onions but it is possible to make stifado with larger onions. While some versions may include tomatoes, the oldest ones do not. This is because tomatoes were not brought to Greece until after the Americas were discovered. Preheat oven to 160C. Heat the olive oil in a large saucepan and brown the meat in it. It will produce a lot of moisture but persevere until it has all evaporated and the meat starts to turn golden. Slowly pour the vinegar over it, and when the steam subsides, add the wine. Then add all the remaining ingredients except the vegetable oil, onions, and sugar, cover and cook slowly for 1 hour or until the meat is almost tender. Heat the vegetable oil in a frying pan and add as many onions in one layer as it will take. Sautee them gently for about 15 minutes, shaking and turning them over until they brown lightly. Lift them out with a slotted spoon and spread them over the meat, distributing them evenly. Repeat until all the onions are done. Sprinkle the sugar over the onions, cover and cook very gently for 30 minutes, until the onions are soft but not disintegrating. Do not stir once the onions have been added, but rotate the saucepan occasionally to coat them in the sauce.